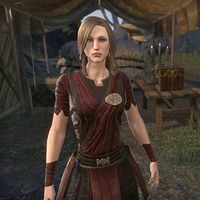 Jena Calvus is an Imperial guild trader who can be found at her stall, Calvus & Co., in Vivec City. "Papa always tells me that I'm the best shop girl he's got, but I'm the only one he's got! Compliments are nice and all, but only when deserved. So, well, hello. What do you need?" "Yes, um, well, yes, hello! Nice to, well, meet you. Um... How can I best be helping you? Oh drat, I mean, help you! How can I best help you!" "You don't understand how hard it is, greeting customers every day, one after another! It's not as easy as it looks. And I'm still not doing a very good job at it, am I? Oh, um, can I help you?" "Is there something I can shop you for today? No, wait. Is there something you're looking to help? No, drat! Um, care to look at my wares?" This page was last modified on 4 July 2018, at 00:47.